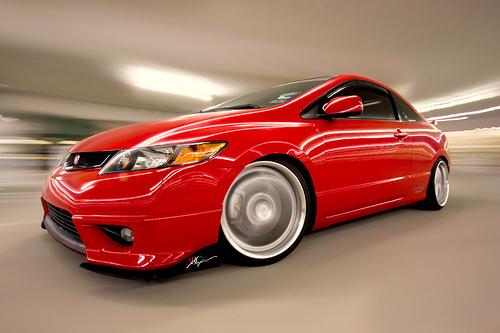 The following post is a guest post from James Evins– an automotive photographer from Houston. Hi! My name is James Evins, and I am going to talk to you guys (and girls) about a nifty way to build your own automotive rig! Who doesn’t love rig shots? 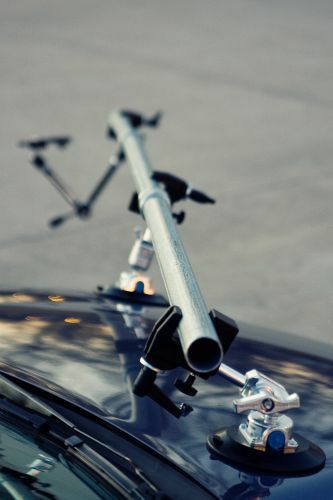 The sense of motion achieved and the interesting angles that would be nearly impossible in a car to car or panning shot make automotive rigs an invaluable tool to automotive photographers. Unfortunately, rig shots have been one of the bigger secrets of automotive photography in the last few years. I assume a lot of photographers feel that their methods give them a definitive advantage over their peers. Also, there are companies that will sell you and entire kit for twice as much as you’d spend building it yourself – so why give the secret away? I’ve always believed in the sharing of knowledge, as it makes us all stronger photographers. 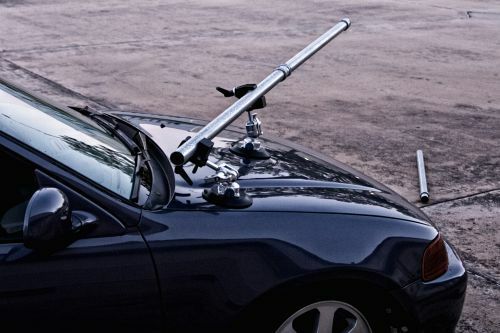 This tutorial will show you how to build a DIY suction cup mounted automotive rig on a budget. This is not necessarily the best way to do it, and there are many other methods. I feel this tutorial was very important, though, because it is easy enough for the average photographer and won’t put too much of a dent in your wallet! Here are the cups and the clamps attached to them. The clamps bolt down onto the studs coming from the cups. If you notice, the cups have a small blue extension – this is where you pump them up. You pump until the red line is gone, if it shows up again it means suction is limited, pump some more. 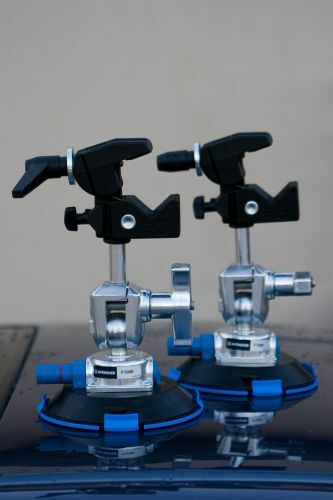 The cups are Avenger F1000s, and the clamps are Manfrotto Super Clamps. These can all be purchased of Adorama or B&H. Next is the piping, as well as the clamps & cups. The piping is the only “custom” part of the rig. You can use a lot of things. I purchased electrical conduit piping, 1.5″ in diameter, and used the matching compression couplers. I have three sections of around 5′ feet. This can be found in Lowes or Home Depot (or similar hardware supply store). Here is the magic arm. It’s pretty simple. The clamps shown on the cups? Use one of them here, and attach to the stud on the magic arm. Attach magic arm to camera. 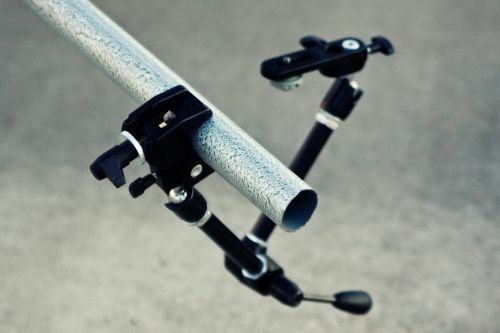 This can also be replaced by a tripod head, which you could drill the pipe and attach, that would be sturdy as well. Alright, so I’ve showed you what parts you need – so what about actually getting the shot? Well, the basics of it are simple – attach the cups to the car, roll the car, take a photo while it’s moving. I’ll go over some of the specifics below. First of all, attach two super clamps to the end of your cups and then one to the end of the magic arm. The cups should be arranged on the car and positioned. 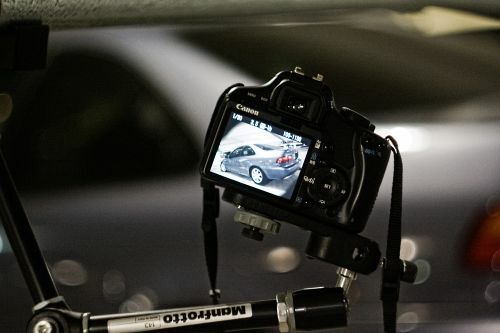 Remember to put as much distance as you can between camera and car so that you don’t have to shoot at the widest angle possible – this helps avoid distortion. You want to find sturdy, flat sections to attach the cups. Try putting the cups close to the edges of the body panels where they are most sturdy, not directly in the center where they have less support. If you aren’t careful, you can dent or flex a panel and possibly crack the paint. Remember to always use the covers on your cups when you aren’t using them. I clean the surface with spray on glass cleaner before I apply it. These cups can leave small pressure rings on paint, and if any dirt is on the cup you can cause deep scratches so be extra careful. 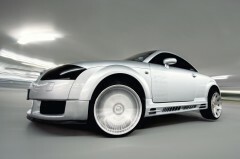 Warn the owner of the car that a slight buffing may be needed afterwards. Never apply to a freshly painted surface. Next, you’ll want to pump your cups up until they grip and the red line is no longer visible. Now you can apply your pipes to the clamps. Tighten every knob on the cup and clamp, and give it a firm tug to make sure everything is sturdy. Now you can attach your sections of pipe using the compression couplers mentioned. Attach the magic arm to the end of the pipe via the super clamp. Position the camera and set it to shutter priority mode, or manual mode. Attach your wireless shutter trigger or set the camera to timed shutter release. Now you’re ready to take the shot! Its time to push! When pushing the car, you’ll want to move very slowly. The slower the better, to prevent camera shake. Make sure the engine is off, and if possible lock the steering wheel in place to keep it from moving. The technique to taking the shot is to take a long enough exposure to show a sense of motion while still showing detail in the background. This is really up to you and your own preference – try a few at a slower shutter, and try a few at a longer shutter. You may need to use a neutral density filter to get the exposure times you need – the fastest shutter speed I’d recommend is 1.5 seconds. I’ve done as long as 20 second exposures. Set the timer or use your wireless remote, and slowly push the car and take the photo. You may want to take a static shot first so you have a sharp image of the body of the car you can merge and blend into your moving shot if it doesn’t come out as sharp as you desire. Notice you don’t see the rig on any of the car shots. You will need to post process the rig away. As far as the post processing goes, it takes a little creativity – practice with your clone tool! Remember, use the biggest and softest brush you can get away with. Practice makes perfect, and never rush the job! Thanks for reading my quick tutorial – there is much more to really soak in when it comes to taking a rig shot, but the best way to figure it out is to get out and try yourself! Check out more cool car photography by James. Can I confirm, you push the car not drive with the engine running? What is the Wall dickness of the Aluminium Piping? Does this have to be done with a dslr? Or can I use a normal one? Anybody knows where I can buy this stuf in the Netherlands/Europe?